Current month and historical time-window performance for the Stark 300 CTA Index, the Stark Funds Index, and a variety of sub-indices based on trading style category, trading approach, and market sectors. Current month and time-window performance of the CTA industry versus various asset class benchmark indices. Technical analysis including asset versus VAMI charts on the Stark 300 and Fund Indices. Linear regression chart analysis on the various Stark indices. Additional value-added content related to managed futures investing from third-party contributors. 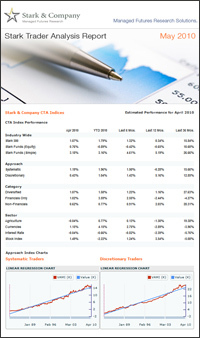 The Stark Trader Analysis Report is delivered by email to STAR CTA Database subscribers or any registered user of the Stark CTA Indices & Rankings.